It is important to understand what a crown is and the different types of crowns available. A dentist can create a treatment plan with any of the following types of crowns. First, let's define what a crown is. Ceramic crowns are made of a porcelain-based material and are used to help restore front teeth, as they are designed to blend the most with the natural tooth color. The toughness of crowns depends on numerous factors. The gold and metal alloy crowns are known for being the most robust against wear and tear, such as teeth grinding. Taking care of the teeth daily, while also participating in regular checkups with the dentist, are the best ways to ensure proper tooth and oral care to prevent the need for crowns in the first place. Dental crowns are fixed prosthetic devices cemented directly onto existing teeth or implants, which means they are not movable. 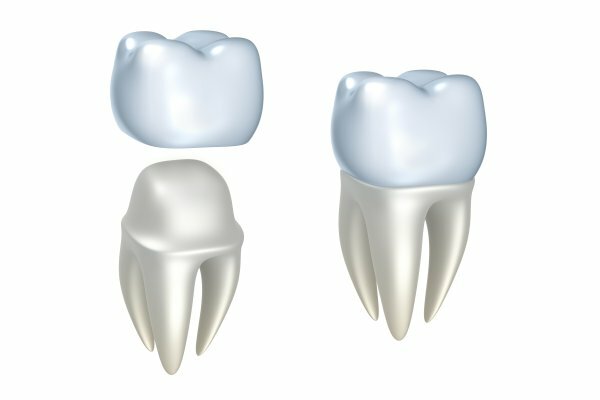 Crowns can also be utilized in dental bridges to seal a gap if there is a missing tooth. Due to their many uses, it's essential to understand the different types of dental crowns and the advantages of each. Ceramic or porcelain-based dental crowns are often applied to restore front teeth. Due to their natural color and texture, ceramic crowns can blend smoothly with the remaining natural teeth and can have a hint of color to match the healthy teeth. Porcelain crowns are not well-suited for molars and premolars, as ceramic can become brittle when exposed to massive biting forces. Porcelain fused to metal crowns offers patients the best of both worlds. The porcelain part of the crown provides the patient with a natural-looking tooth, and the metal construction is ultra-durable. To achieve a porcelain fused to metal restoration, the dentist must scale away a moderate amount of tooth structure. Dental crowns created from gold alloys comprise a combination of copper, gold and various other metals. Gold alloys grant numerous perks over other dental crown types. This type of crown is robust and will not fracture. It will also not wear down the underlying tooth. Gold alloys are biocompatible with gum tissue. Base metal alloy dental crowns are resistant to corrosion and are incredibly durable. They also contain non-noble metals that are gentle against neighboring teeth. Before a dentist can apply this type of crown, the dentist will remove a minimal amount of tooth structure. Not only do permanent crowns protect teeth, fill in gaps and increase function, they can also give the patient a beautiful smile. Crowns can be used on dental patients of all ages and can deliver a friendly and improved smile makeover while decreasing tooth pain. Each patient is different, but exploring the types of dental crowns will assist in a specific treatment plan that will benefit a patient's situation. Request an appointment here: https://www.cosmeticdentistoffice.com or call Rachel Cole DDS PC at (503) 248-1114 for an appointment in our Portland office.